Perhaps the most important, but often undervalued step to starting a business in Texas is writing a business plan. A lot of people only write a business plan because the bank won’t loan them money until a business plan is submitted. That’s a valid reason, but there is a more important benefit. Writing a business plan gets the ideas out of the entrepreneur’s head and helps to create a roadmap for where they want the business to go. Business planning is a critical element to creating a successful business. Read more about how to write a business plan and what goes into one. Here is a free Business Plan Template we created to help you get started. If you need more inspiration, try these free Sample Business Plans. Last if the business plan template and sample business plans don’t provide enough guidance, check out software like Live Plan or Business Plan Pro that quickly guides you through writing the business plan and creating financial projections. The second step to start a business in Texas is selecting a business entity. The business entity is sometimes referred to as the business structure. This is how a business is legally organized to do business. The four primary business entities include the sole proprietorship, partnership, corporation and LLC. A brief description of each is below. A Sole Proprietorship is an individual entrepreneur that decides to go into business for themselves. This is the easiest and least expensive of the four entities to set up. The owner is personally responsible for all debts and actions of the company. This is called unlimited liability and is the biggest downside to the sole proprietorship. This means if the business is sued, the owner’s personal assets are potentially at risk. The owner will also pay self-employment tax on all business profits and may pay more in taxes than other entities. There is no filing for a sole proprietorship in Texas. Learn more about the sole proprietorship advantages and disadvantages. General Partnerships consist of two or more people conducting a business together. Like the sole proprietorship, there is no formal filing. Also like the sole proprietorship, the partnership has unlimited liability. If the partnership were to be sued, each of the partner’s personal assets are potentially at risk. The partnership itself does not pay tax from business income. Instead, profits and losses are passed through to the owner’s personal tax return. This income is subject to self-employment tax. A Corporation is a legal business entity that is separate from the individual. While corporations are more expensive and complicated than sole proprietorships and partnerships to form, the major advantage is that the corporation shields the owner’s personal assets should the corporation be sued. There are multiple ways a corporation can elect to be taxed. Also, there is no self-employment tax with a corporation as income to the owner(s) will come from either a salary or dividends. To form a corporation, the Certificate of Formation needs to be filed with the Secretary of State. The cost to file is $300. The Limited Liability Company (LLC) is a popular business entity choice. It provides the liability protection of a corporation with the ease of operation like a sole proprietorship. The Limited Liability Company does not have the many burdens a corporation such as holding a board of directors meeting, shareholders meeting, taking minutes, etc. The LLC also has the greatest tax flexibility of the four entities. Income can be taxed as a pass-through entity like the sole proprietor or partnership or as a corporation. To form a Texas LLC, the Certificate of Formation needs to be filed with the Secretary of State. The cost to file is $300. Learn to form a Texas LLC with our step-by-step guide. To compare the pros and cons of each of the entities, see our comparison chart of business entities. 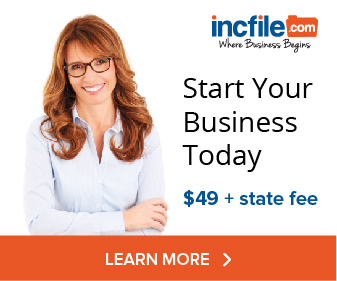 IncFile - $49 plus state fees & free registered agent for 1 year. 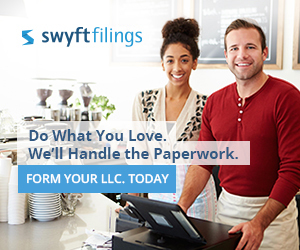 Swyft Filings - $49 plus state fees. Northwest - $49 plus state fees. After deciding on a business entity, the next step in starting a business in Texas is to register a business name. If you are a sole proprietorship or general partnership in Texas and doing business under your full first and last name, John Smith for example, there is no filing, but if the business will operate under a fictitious business name or DBA (Doing Business As) like John Smith’s Handyman Service, Mr. Handyman, etc, you will need to file for an Assumed Name Certificate, sometimes known as a DBA or Doing Business As with the County Clerk’s office where the business will be located. Learn how to register a DBA in Texas. Corporations and LLCs have to pick a name at the time of filing for the entity and each corporation/LLC has to be uniquely named. Learn how to check the availability of corporation and LLC names in Texas. A trademark can legally stop others from using names, slogans, or logos that are associated with another brand, product or service. The U.S. Patent & Trademark Office (USPTO) manages the registration of trademarks. Before settling on a name, check the USPTO database to see if the name you want to use isn't registered to another business. Registering your business name will not necessarily stop anyone else from using the name you choose. To protect your business name, consider registering for a trademark. The Employer Identification Number or EIN (sometimes referred to as the Federal Employer Identification Number or FEIN) is a nine-digit tax identification number from the Internal Revenue Service (IRS). This number identifies a business operating in the U.S, tracks tax returns and is used to open a bank account. Much like what a social security number is to a person, the EIN is a social security number for a business. While most businesses will need to get an EIN, some do not. Partnerships, corporations and many LLCs OR sole proprietorships with employees must file for an EIN. Sole proprietorships or a single-member LLC with no employees is NOT required to get an EIN. In these instances, the owner’s social security number is used. Filing the EIN online only takes a few minutes and the number is available immediately. Filing can also be done by mailing the SS-4 form or by calling the IRS. For more information about how to apply and to see our video with a step-by-step guide, check out how to file for an EIN. To start a business in Texas, a company may require certain permits and/or licensing. While there is no general state of Texas business license, a business may need to register with a variety of agencies before opening. Texas Sales Tax Permit – Businesses that are engaged in selling or leasing tangible personal property or taxable services in Texas need to apply for a Texas Sales Tax Permit. Generally speaking, physical products sold at retail are taxable within Texas, while services in Texas are generally not taxable. For more information on the Texas Sales Tax Permit, visit the Texas Comptroller. Professional & Occupational Licenses – A variety of professionals in the state are regulated and need to register such as therapists, tattoo studios, salvage brokers, food establishments and many more. Additional information, fees and licensing requirements for professions are available from the Texas Department of State Health Services. In addition to professional licenses, businesses in a variety of industries such as food establishments, daycares, salvage yards and many others require licensing. Local Business Licenses – Most cities, towns and/or counties in Texas require a business to register, even occasionally those that are home-based businesses. Each local entity has its own rules for business activity, so requirements vary depending on location as some require a business license while others have requirements for zoning, building/ building improvements, signage requirements, liquor licenses, etc. The city hall, mayor, economic development office or even the Chamber of Commerce are all good places to contact and find if you need a business license in your community. Obtaining financing for a small business can be a stressful and time-consuming process. Similar to getting a home loan, the bank is going to want lots of documentation on your personal finances in addition to a solid idea and the business plan. As a rule of thumb, banks will want to see the owner invest 15%-25% of their money (equity) into a start-up business. That can include cash but also any buildings, tools, vehicles, inventory and equipment that will be used in the business. It is likely that the bank will want a lien on those items. Credit score is going to play a large part in getting a loan approved. Start-up business loans are largely based on the owner’s personal credit and their personal financial statement. Conventional Bank Loan – These are available at many financial institutions like banks and credit unions. Banks are typically very conservative and place a lot of weight on the owner’s personal credit, equity and collateral. After reviewing the business plan and personal financial information, they will respond with a yes, no or maybe. Yes is great but we recommend talking with at least three banks to get the best rates and terms for your business. No isn’t necessarily bad, as a bank may have many loans with other businesses in your industry or they don’t make loans for your type of business (restaurants are a typical example). If your loan has more risk than they want or if you don’t have sufficient credit, equity or collateral they may answer with a maybe and want a loan guarantee. Expect the loan approval process to take anywhere from 2 weeks to 6 months (and possibly more) depending on the amount being borrowed, the complexity of the project and owner’s personal financial condition. SBA Loan Guarantee – When a small-business loan is riskier than the bank wants to take on, there are loan guarantee programs from the Small Business Administration (SBA). This is a federal program that provides a guarantee to the bank that will pay a percentage of the loan back to the bank if the loan isn’t paid by the business owner. The percentage depends on the program but typically ranges from 50%-85%. Contrary to popular belief the SBA doesn’t provide business financing but they do help in getting money to small businesses by taking a majority of risk and encouraging the bank to make loans. Another thing to note is that SBA guaranteed loans will cost the owner more in closing costs, fees and interest. Peer-to-Peer Lending – Sometimes a bank isn’t the best option, due to the difficulty in getting a start-up business loan, credit purposes or the time needed to get funding. In this case, peer-to-peer lending provides an interesting way to borrow money without going to a bank. These are personal loans and rates will vary on the owner’s credit. Loans will typically go up to the $35,000 – $40,000 range. Two popular options are Prosper and LendingClub. Grants – There is a lot of information online about all of the free money for businesses and most of it isn’t true. There are some small business grants. Most are for established businesses doing research and but occasionally there are private grants for business startups. Do your research before applying and don’t pay for information telling you where the grants are, no matter how good their money-back guarantee is. All of the federal grant information is available for free at http://grants.gov. Here is more information about finding money to start a business. Loans for start-up businesses are very reliant on the owner’s personal credit score. Before stepping into a bank for financing, it is a good idea to know your credit score. Typically scores above 650 are considered viable so if you aren’t sure, get a copy of your credit report. If there is anything incorrect on your report, take care of those issues before going to the bank. Higher scores not only have a greater approval rate, they also get lower interest rates, saving money over the course of the loan. You can request a free credit report once a year from AnnualCreditReport.com. This report won’t have your score, but it will show all of the credit activity under your name from the three credit reporting companies; Equifax, Experian and TransUnion. This information can be used to fix incorrect information. Before hiring employees, there are several items that a small business owner needs to be familiar with before making their first hire. Fill Out Paperwork For New Employees – When hiring a new employee there are four forms that will need to be filled out; New Hire Reporting (Texas Workforce Commission), I9 (Form I-9, Employment Eligibility Verification) and the W-4 (IRS’s Publication 15 Employer Tax Guide). Federal & State Income Tax Withholding – Employers withhold money from each employee’s paycheck to pay that employee’s federal and state income taxes. The employer pays no part of the withholding tax, but is responsible for collecting and remitting the taxes that are withheld. Social Security & Medicare – To comply with the Federal Insurance Contributions Act (FICA), an employer must withhold the employee’s portion of Social Security and Medicare taxes and the employer matches. Federal & State Unemployment Insurance – Employers are responsible for paying taxes to compensate workers who have recently lost their jobs, which is through federal & state unemployment insurance. Worker’s Compensation Insurance – Workers’ compensation provides compensation benefits and covers medical costs to employees injured on the job. Worker’s Compensation Insurance is administered through the Texas Department of Insurance. Labor Laws – Employers should also understand the various regulations and laws pertaining to employees. If you plan to hire employees, learn the rules that apply to your business. Federal laws, depending on your sales volume and number of employees, may supersede state laws. Consult with the Texas Workforce Commission and U.S. Department of Labor to learn more. If you are unsure of your obligations, an attorney’s guidance can be also useful in assisting you to meet legal requirements. What Does a Business Owner Need to Know About Small Business Bookkeeping? When do you Need to Register a DBA?